We are now accepting applicants for our 2013/14 Editorial Board! Greetings! and welcome to another school year and another year for The Atlas! We are currently on the hunt for some amazingly fantastic individuals to help us with the launch of our 2013/14 issue. You don’t have to be a History major or minor to help us out, but must possess an interest in History and strong writing skills. 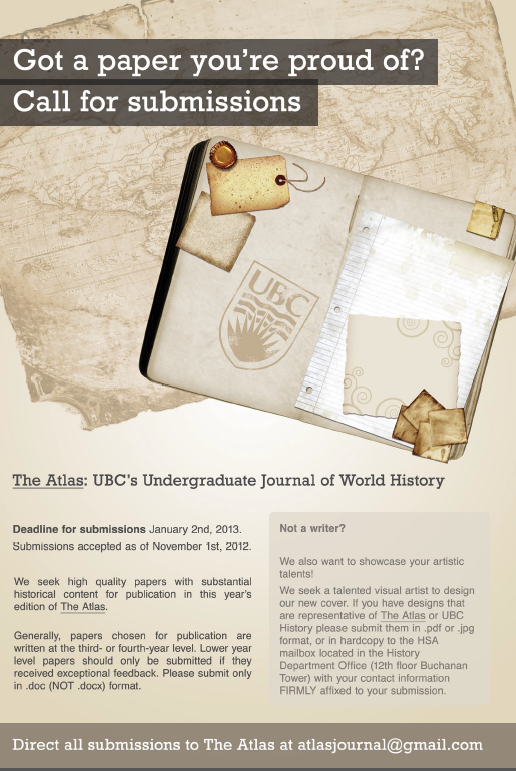 Previous experience is not required as all our Editors will be trained by a member of the UBC History Department. Editors need to be undergraduate students attending UBC Vancouver and registered members of the History Student’ Association (an awesome student club that you can still apply for after our Editorial selections – if you aren’t already a member). If you are interested in helping out with the 2013/14 edition of The Atlas, email us with your year of study, program of study, and a 2-page writing sample to atlasjournal@gmail.com! Applications are due by 11:59pm on October 16, 2013. TIME TO CELEBRATE – Launch Party, April 25! What better way to end the school year than with a LAUNCH PARTY?! Come celebrate with us on April 25, 2013 as we celebrate the successful launch of the 2012/13 edition of The Atlas! We’ll be hanging out in the Simon K.Y. Lee Global Lounge from 5pm to 7:30pm. Our fantastic journals will be on sale for $10.00! This is an event you don’t want to miss out on; come meet the editorial staff and the authors for this year’s edition! RSVP at atlasjournal@gmail.com and we’ll see you there! Thank you to everyone that has submitted their work for the 2013 edition of The Atlas, we look forward to collaborating with you! For those of you that did not submit for this year’s edition, we hope to see your work in the future. In the meantime, we are still on the lookout for A TALENTED INDIVIDUAL TO DESIGN OUR COVER! If you have designs that are representative of The Atlas or UBC History please submit them in .pdf or .jpeg format to atlasjournal@gmail.com, or in hardcopy to the HSA mailbox located in the History Department Office (Buchanan Tower, 12th floor) with your contact information FIRMLY affixed to your submission. Your questions and enquiries about this opportunity can be sent to atlasjournal@gmail.com addressed to Lindsay or Emily. Deadline for cover art is February 28, 2013! We seek high quality papers with substantial historical content for publication in the 2013 edition of The Atlas. While original research is preferred, we consider all work submitted to us. Generally, papers chosen for publication are written at the third- or fourth-year level. Lower year level papers should only be submitted if they received exceptional feedback. Please submit only in .doc format (not .docx)! We also want to showcase your artistic talents! We seek a talented visual artist to design our new cover. 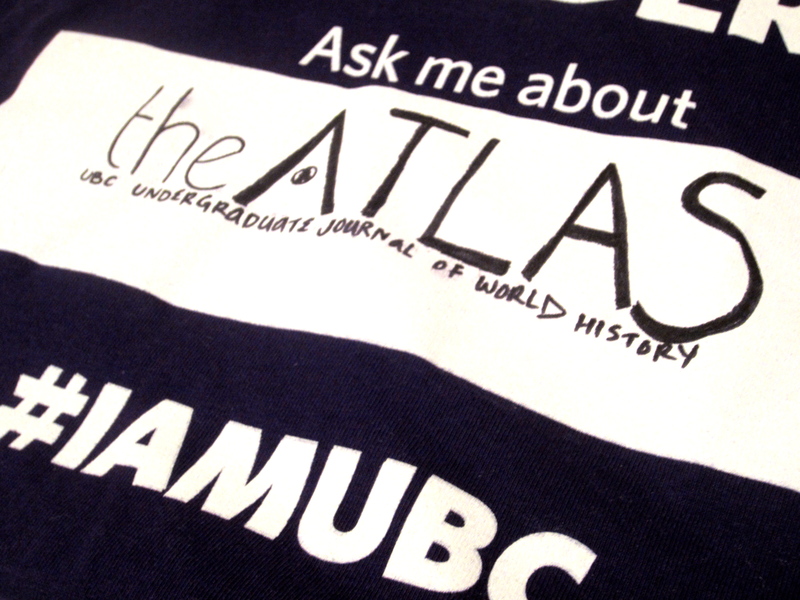 If you have designs that are representative of The Atlas or UBC History please submit them in .pdf or .jpeg format, or in hardcopy to the HSA mailbox located in the History Department Office (Buchanan Tower, 12th floor) with your contact information FIRMLY affixed to your submission. Otherwise, please direct your papers and applications to us online at atlasjournal@gmail.com. P.S: We were so excited to announce this news, we made a Facebook Event for it. [EDIT]: Our deadline has been extended to January 9, 2013 at 11:59pm PST! Visit our Facebook Event page to join the conversation.